I designed in 2012 were between 5 and 6 inches tall. Read me ~> Work in continuous rounds, do not join. I used Red Heart Super Saver and also Red Heart Comfort yarn with a 4.50 mm hook. 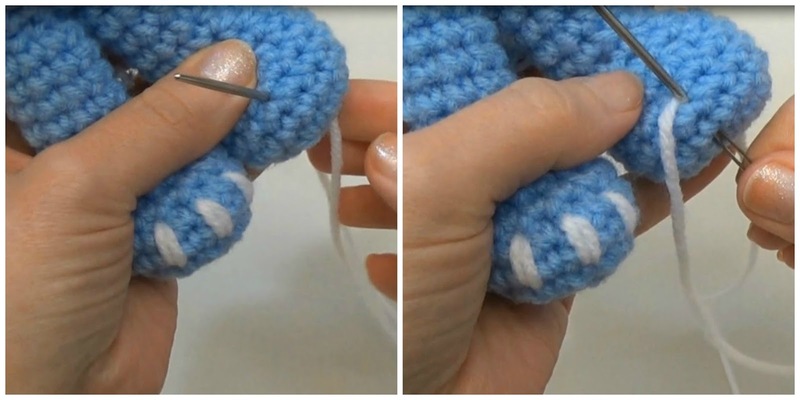 If you crochet more on the loose side then use a smaller hook so you don't get gaps and stuffing showing through the stitches. add in a marker at the end of row 2 and move that marker at the end of every row. sl st next st and f/o leaving a long tail for sewing. Fold a pipe cleaner in half and make a loop at the one end. Push the loop through the open end of the trunk all the way to the other end. Pull up and cut off the excess so that the pipe cleaner is 2 rows shorter than the trunk then push it back into the trunk. 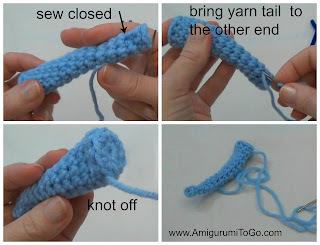 Use the yarn tail to sew the edge between row 15 and 16 closed so seal the pipe cleaner inside the trunk. Bring the yarn tail through the inside of the trunk then out the back, knot off on the edge where you worked in the BLO. 6) ch2 then 1sc in next st, repeat around until you have 7st left to the marker. f/o leaving a long tail for sewing. Fold the last 7st of row 6 in half, right sides together and whip stitch the 2 edges together. f/o leaving a long tail for sewing. 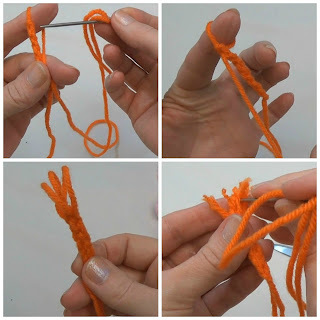 Loop the yarn tail around your finger then weave the other end of the yarn tail in and out along the chain to the slip knot you started off with then back up the chain and loop around your finger again. Repeat 2 more times. You should have 3 loops at one end of the chain when you are done. Cut the loops and run the yarn needle through each yarn strand to fray them. 3) add in toes. Wrap yarn around the front of the foot in 3 different sections. 5) sew on the ears. The part that you whip stitched together sits on the 8th and 9th row. Pin them in place before sewing them in helps. But again, view the video for tips on sewing this part. I am making this with rubber bands hope it comes out great I already made one of your bears with bands this is easy to follow thank you! Thank you! I also take the other creatures. They are so cute! What a fabulous blog you have! I appreciate so very much all the time you've put into your posts. The instructions and photos seem clear and easy... 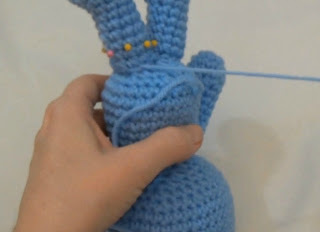 This will be my FIRST amigurumi, so thank you again for the detailed instructions. I can't wait to get started!!! Thank you for this cute elephant. I am new to crochet but found the pattern really easy to follow. Will definitely be trying the others as soon as I have brought my yarn. These little animals are adorable. 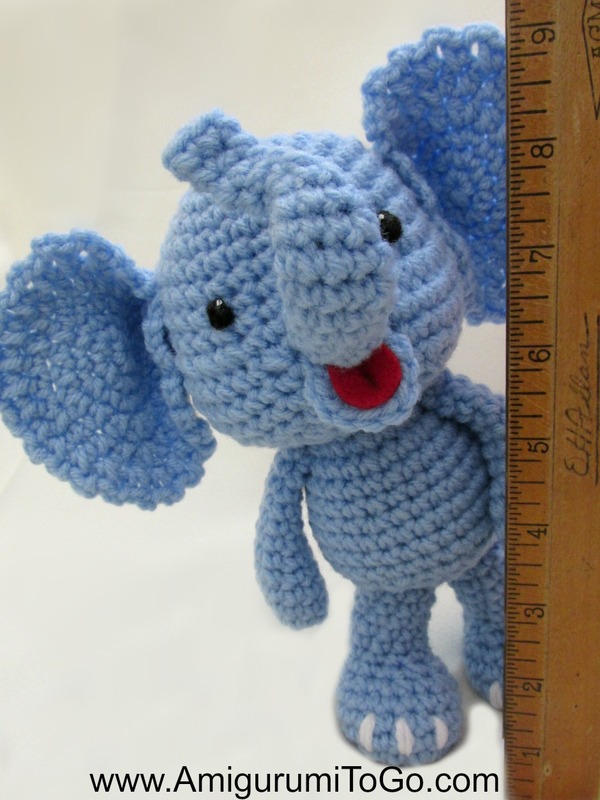 I will be a great grandmother in February and I am starting to crochet all the animals. My first monkey had some mistakes, but I am hoping my little pig will be better. It seems to be going smoother. I really appreciate you sharing your patterns. It goes to show that you are not selfish. I'm so happy you are enjoying the patterns, that means a lot to me. Im really kind of new to crocheting so this may be a dumb questions. If I wanted to increase the size of this animal other than just changing the size of the hook, is it possible to say double the stitches or do each step twice? My sister just had a baby and the room is decorated in elephants. I wanted to make this for her is a whole bunch of sizes. One may be 3 ft tall....Is that possible? Thank you for this pattern. This is so cute and easy but I want to add tooth. Are you help me ? Hi Sharon. Thank you so much for providing the patterns. Now I am looking forward to weekend to get start on this. Your dear and darling little animals make me oh, so happy!!!! Thank you for not only giving birth to them, but sharing how to make them!! May the joy they bring others be visited on you thousandfold! I have just started crocheting a few weeks ago and I watched dozens of Youtube movies... But your little Elephant is the first one that I trust myself to give it a try! I just love your movies, the way you explain, the comforting tone of your voice and the excellent image quality. And did I mention how totally sweet, adorable this little bigfoot family is? Hi Sharon, thank you for the inspiration! 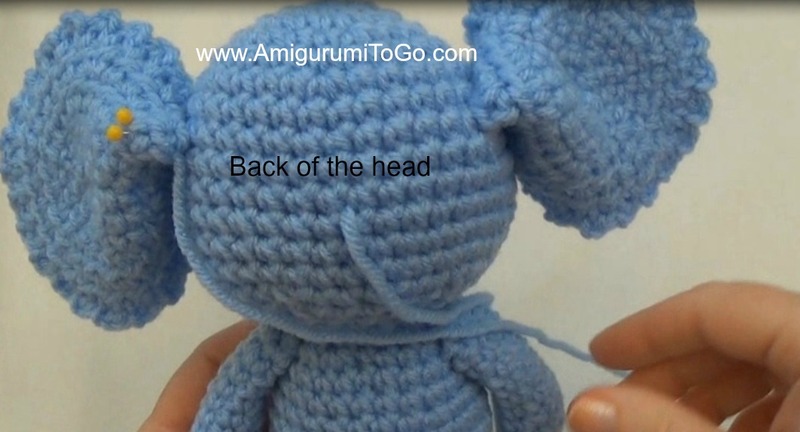 I just did a post on my blog featuring you, because your 'crochet along elephant' video taught me about 90% of what I know of amigurumi:). (Only a reference, one pic and a link, like you asked). merci infiniment pour ce très beau partage. Mon petit-fils va être ravi de pouvoir disposer de tout un panel de petits animaux. These little elephants look so alive - they look like they're playing with each other. Super job! I know just the little girl (or two or three) that will love this. thank you for sharing these gorgeous patterns! Merci pour ces merveilleux modèles d'animaux, mon petit-fils va être heureux. Thank you for your wonderfull free patterns. Merci pour vos merveilleux modèles gratuits d'animaux!!! I believe what is causing the mess with your sewing is the stuffing you are using. I use 100% polyester stuffing that is made for toys and pillows. It's very soft and springy. When I bring my yarn needle through my amigurumi it glides through and doesn't pull any stuffing with it. I have in the past used a stuffing that was a bit course and it made my amigurumi lumpy when I sewed it together. I hope that has helped! It does!!! I am sure this is the problem!!! Thank you so much! PS: One more question, I saw little styrofoam balls in the shop the other day, could I use them as stuffing too? 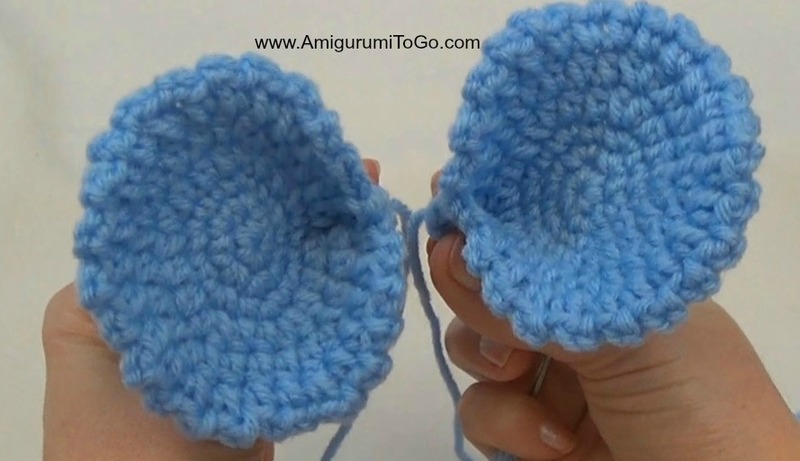 Since they are hard you wouldn't be able to shape them but they would be ok if they stuffed one part completely, like a foot and they took up all the space inside the yarn. Muchas gracias por las explicaciones. Do you have a pdf file for this pattern? I hope that you enjoy it. First, I want to tell you how much I appreciate your site and your patterns. 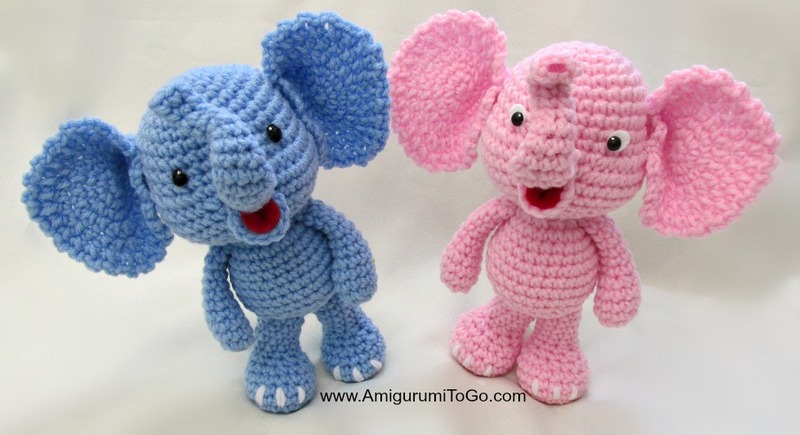 your creationa are fantastic, the patterns are easy to read and I've loved making the dress me bunnies, both boy and girl, and am excited to start the little bigfoot elephant as a gift. I was wondering, is there a way that I could alter either this pattern or the overall pattern from the dress me bunny to make them compatible? I want to make an elephant with lederhosen for my german grandfater, and thought that these patterns might be able to work together, but I thought I'd ask your thoughts before I put hook to yarn. what was the name you used when sending the gift? gift giving isn't suppose to make one feel bad and it is never my intention to make another human feel bad.. I always just assume people are grateful when they pass by here or my facebook/youtube or wherever they find the patterns so if I have appeared ungrateful to you, my apologies. I do have a thank you on the donation button itself. And also at the bottom of each post I express my gratitude. As a practice I don't send emails to paypal email addresses. I just have never done that unless someone gives their return email inside the paypal note. If you would kindly tell me your real name you used in the paypal I could return an email. These are just sooo cute! I've just finished two bears (to my cousin and my little brother, and I know they are going to love it), and I saw these cuties. My little cousin Anna loooves elephants, she is going to be thrilled if I can make an yellow ellephant to give her. I'm buying yarn tomorrow and giving it a try! Sharon, I just adore your little critters! They're so cute and the patterns are super easy to follow. I can't thank you enough for these amazing patterns. They are so much fun to make. My kids love them as well! Thank you so much for taking the time to write, I really appreciate it. I'm so happy you are enjoying crochet and like my patterns, that means a whole lot to me! Keep up the great work, 11 yrs old, wow!! You are a smart girl and you will never be bored when you can make things with your own hands. I fell in love with this little elephant. I will be making him in white, and making 'Steam Punk' clothing and accessories for him. 'Jules Verne' style. I will offer him as a prize in the unsolvedmysteries.com Coffee House contest in October or November...of course there will be a humorous backstory...I will credit you with the basic pattern. Thanks for sharing your awesome talent. Oops! I just purchased a great big ball of Bernat Baby Sport.. I didn't realize it wasn't the right ply for the project. If you were using this particular yarn, what size crochet hook would you use? I know this will be a smaller elephant than anticipated, but that's okay. any ply will work really but for the size of elephant I got then I put in the suggested yarn and hook size. I just googled Bernat Baby Sport and it calls for a size G/6 which is a 4mm. 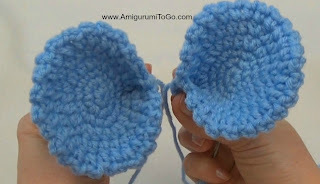 If you start to see gaps in your stitches just switch to a smaller hook. Have fun! Thank you Sharon for your free patterns, I just love them, I have downloaded this one and also the Teddy Bear. I will be back. Hi! First of all, thank you so much for your amazingly cute recipe!! Second, I have made the elephant and I'd like to make a bigger version, so I've decided to try on hooks size 10-12 mm. Can you recommend a type of yarn, specific search words or a website that helps finding big yarn? I have been googling without much luck, possibly because I am fairly new to the crocheting adventure. I live in Denmark and generally use webshops for my yarn purchase, but this time I am stuck as I normally find the yarn first and then choose the hook, so can you give some tips on going to opposite way? So far I've been reading all the little labels on amazon/ebay searches, but I am hoping there's a better way? thank you for the kind words, I'm so glad you are enjoying the patterns. Thank you very much for this pattern you generously share with us. I am in the process of making this big foot family to donate for children who suffered from cancer in 1 hospital in Central Java, Indonesia (i participate in 1 charity event). So far, i have finish 1 dress up bunny, but i will make more and i have relax target date until January 2016. Hello! These patterns are so cute, you are very talented! I was wondering if you could make a rhino sometime, they are my all time favorite animal and I can never find anything cute like this for them. Thank you again for the pattern! Dear Sharon, I just want to say thank you so much for these darling patterns. I have 2 new little ones on my Christmas list this year and very little money. These let me give them something darling and filled with love. I am making my way through your little big foots. Panda, monkey, giraffe and now elephant. I already made your dress up pig, bunny and art the moose. The turtle is next then the lion. I will be making every pattern you have ☺ thx so much. My niece is playing right now with her monkey. She is 6 mths old and so far loves her to pieces (well hopefully not to pieces). I made the elephant and embroidered the eyes and mouth as it was a gift for a boy with an infant sister. Where can I post the photo? I love your work. It is so whimsical. Hi!! I just have a question, do u chain 2 and then put 6 sc in each hole to start off. Cause its not in the video how u started off. Im just learning to crochet other things. Ty ur stuff is so cute. LOVED this pattern I made grey one with blue accents for a friends baby! ch2 then 1sc in next st, repeat that, ch2 then 1sc in next st, repeat again and again until you have 7st left in the row. It's shown in the video if this doesn't make sense. Thank you! Thank yiu! 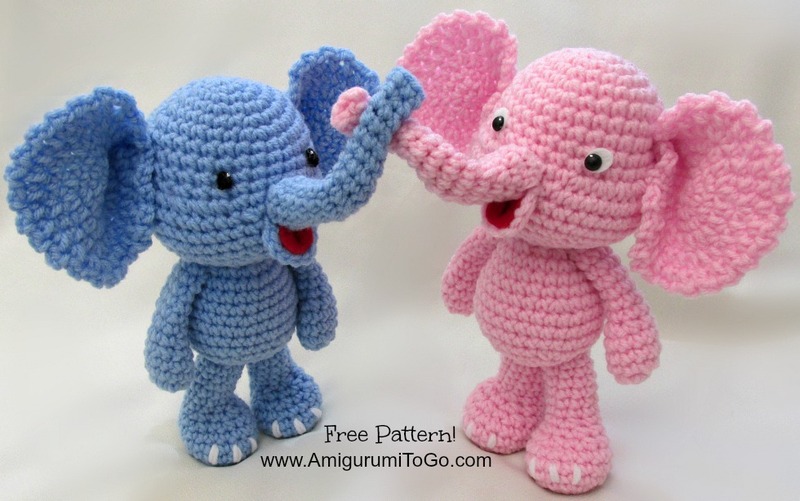 Thank you for the cutest Little Bigfoot Elephant pattern...and the others as well! Now my gift for the baby boy that's due n 6 weeks is complete...afghan, cap and Little Bigfoot Elephant. Being that it's for a newborn baby, I changed a few things to make it child friendly. #1 I eleminated the pipe cleaner completely. We can't have that sweet baby stratchjng his face, can we? #2 Instead of buttons or safety eyes, I embroidered them on with black thread. #3 Last, but not the least, I crocheted the red tongue rather than gluing a piece of red felt. I wish I could attach a picture, he's just so adorable! Hi Danielle, sorry you're having troubles. I do have a full video tutorial though so the only thing I can suggest to you is watch the video. I start from the very first row and will take you right to the end of the pattern. I show you how to stuff it and sew it together as well. The video link is near the top of this page just under the stitch abbreviation chart. it is the same picture as the pattern and the video too. What do you mean? Hello Sharon, I have made several of you amigurumi animals and everyone loves them, including myself. I am working your elephant right now and I have done the arm pattern 3 times and I keep coming up with 8 stitches in row 5, the written pattern says there should be 9 stitches. Is there a mistake or am I just missing something? Sharon, I am so sorry! I just realized that I was missing a stitch in row 5 of the arm and once I put it in, it came to 9 stitches. I have made this little elephant and it is exactly like the picture. Are you sure you followed the pattern exactly? made one of these today. i even done it in a way so that my elephant is wearing a cute striped jumper! love the patterns. can't wait to make another of your wonderful creations. Tasteful and wonderful. I've enjoyed it much. Thank you. I just made an adorable elephant from watching your you tube video. What a fantastic job you have done. Easy to follow and I am excited to say it turned out so cute. I made this for a 1 year old's birthday. Cant wait for her to open her gift. I wish I could post a picture. Thank You So Much! I will be trying your other patterns and videos. Hi,thank you very very much for the patterns. We are making kids toys to donate to the children's homes and can unfortunately not donate at this stage but you are going to make hundreds of needy kids very very happy. Bless you. bravo et grand merci pour vos magnifiques ouvrages ! beaucoups de talents ! il me tarde de me mettre au travail ! I'm new to crochet and making this for my first baby (due in 8 weeks!). I think I will put a squeaker in the elephant's head. Thank you for designing and sharing this pattern. I was wanting to know if you had a tiger pattern?? superbe ! un grand merci !grand talent ! j'aime beaucoup vos ouvrages ! I just finished my first elephant! Greetings from Finland! I made the Little Bigfoot Elephant to my sister. The pattern was really good. Thank you! It was my first amigurumi. Can I send a photo of an elephant? Greetings from the Netherlands, another lovely parttern, that I am going to try! THANKS! 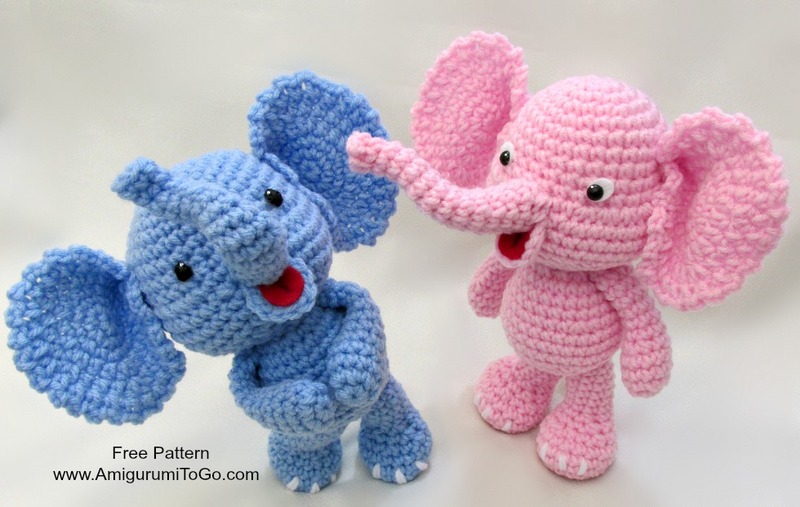 Sooo happy to find your patterns on Youtube, Sharon thank you soooo much, you are Great Teacher, I never did crochet before, until 2 Months ago, I made already four Crochet Bears and now I am working on the Elephant, made my grandkids happy! Big thanks! Do have a pattern for a unicorn? I love watching your videos and your patterns are by far the easiest to read and follow along! I'd only been crocheting a week when I attempted your Little Bigfoot Elephant. I've now made two of them amongst other items people have requested. 😁 thank so much!